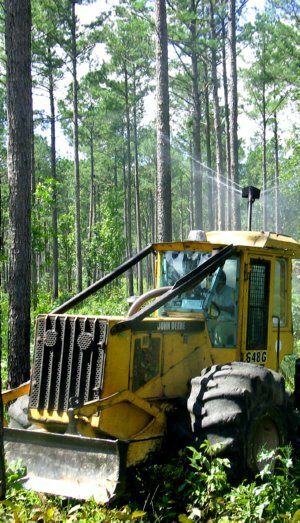 Mid-Rotation Release, also referred to as Quaility Vegetation Management, is a herbicide application in a pine stand that is typically 10 years old or older. Often this herbicide application is administered directly following the first thin. In many cases hardwood competition in pine plantations is suppressed from about year 5 until the first time the stand is thinned. Once the stand is thinned, the increase in the amount of sunlight to the forest floor releases the hardwood competition present in the mid and understory. If not controlled, the hardwoods will grow rapidly and densely populate the mid and understory, resulting in reduced timber yields and poor wildlife habitat. These hardwoods shade out wildlife friendly grasses and forbs on the forest floor, while draining valuable nutrients and growth from the pine overstory. The root systems on these hardwoods are often vast and sometimes older than the pine stand itself. The only way to remove these well established undesirable hardwoods from the stand is to use specially designed, environmentally safe selective herbicides. 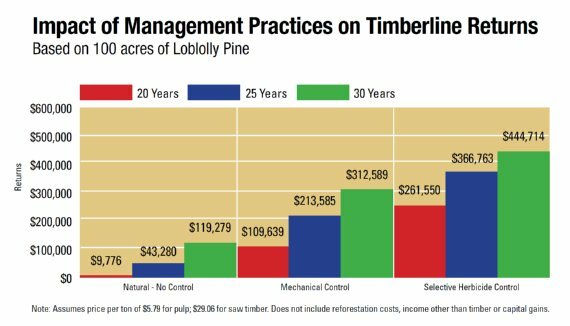 Once the pine forest is released from this hardwood competition, the pine stand can grow at its full potential, and the wildlife habitat is drastically improved. The pine grass/forb ecosystem created can be maintained by periodic prescribed fire once the hardwoods have been eliminated.